The cold open, which found Baldwin’s Trump at a piano pretending to play the song, featured almost every member of the cast who’s played a member of the Trump administration. That included Scarlett Johansson reprising her role as Ivanka Trump, Kate McKinnon as Kellyanne Conway, Beck Bennett playing the role of Mike Pence and Mikey Day as Donald Trump Jr. Unfortunately absent, however, was fan-favorite Melissa McCarthy as White House Press Secretary Sean Spicer. The song was a direct callback to McKinnon’s heartfelt cold open during the “SNL” episode that followed the 2016 presidential election. It was also the first episode to follow Cohen’s death. “SNL” perfectly turned that emotional moment into a skewering of the Trump administration, which has spent the week embattled with a series of controversies related to the firing of former FBI Director James Comey and Trump’s leaking of classified information to Russia. 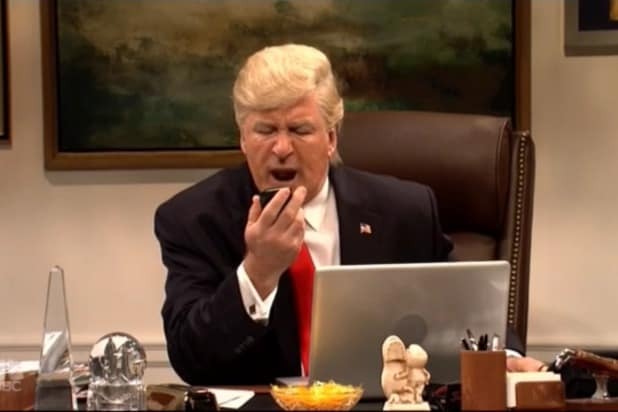 Baldwin’s Trump closed the cold open with a final gag. For more “SNL” goodness, check out our coverage of past sketches here.